Annual Marble Festival Coming Soon! 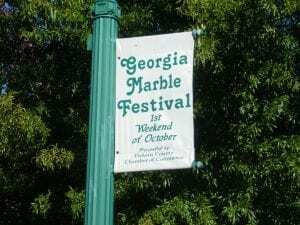 JASPER, GA – The Georgia Marble Festival will be held the first weekend in October this year at Lee Newton Park across from Jasper Middle School. Once a year, this celebration allows the public to tour the largest open pit marble quarries in the world and enjoy various crafts at the Georgia Marble Festival in Pickens County. The Festival celebrates one of Georgia’s most beautiful natural resources available. For decades Georgia Marble has been mined and used to create historic architecture around the world. This year’s tour offers individuals a chance to view and learn the history of Georgia Marble in its natural form as they visit several historic sites associated with the marble industry. Thousands of people attend each year to see different works of arts and crafts, along with Pickens County’s heritage and the marble industry. As always, citizens are expecting an influx of visitors to make it a great turn out.